The Bombardier Q400 specifications and dimensions information listed here is from various data sources including information published by the manufacturer (Bombardier) and data posted by the Federal Aviation Administration (FAA). Our team has researched the most important data sources to compile a complete overview of the specifications for the aircraft. The dimensions and specifications on this page also apply to the De Havilland Dash-8-400, Bombardier DH4, Bombardier DH8D, and the De Havilland Canada DHC-8-400. Those aircraft are actually different names for the Bombardier Q400 turboprop. In addition, the specifications below also apply to the Bombardier Q400 NextGen, which is just an upgraded interior version of the turboprop. This article covers the following specifications for the Q400 turboprop, in the following order, passenger capacity, exterior dimensions, interior dimensions, cargo capacity, performance with range, speed, max speed and cruise speed, airspeed limits, takeoff and landing field lengths (runway lengths), maximum takeoff and landing weights, maximum zero fuel and operating weights, maximum payload, maximum operating altitude or service ceiling, fuel types and capacities. Information on the propellers and engines on the aircraft are also provided at the end of the article. Up to 96 persons with proper certification / configuration. 90 passengers total with 6 crew members. Two pilots, 1 check pilot and up to 3 flight attendants. The 90 seat version was certified by Transport Canada on August 1st, 2018. Previously, Bombardier had an 80 seat version of the Q400 that was introduced by the company in 2014 and first used by Nok Air of Thailand. The aircraft has seen its seat count increase from the 70 seat range to the 90 seat version (2018). SpiceJet was the first airline to operate the 90 seat version of the turboprop. For more on the Bombardier Q400 Interior Dimensions visit the Bombardier Q400 Interior Page. Above is a Bombardier Q400 dimensions photo (part of the specifications). 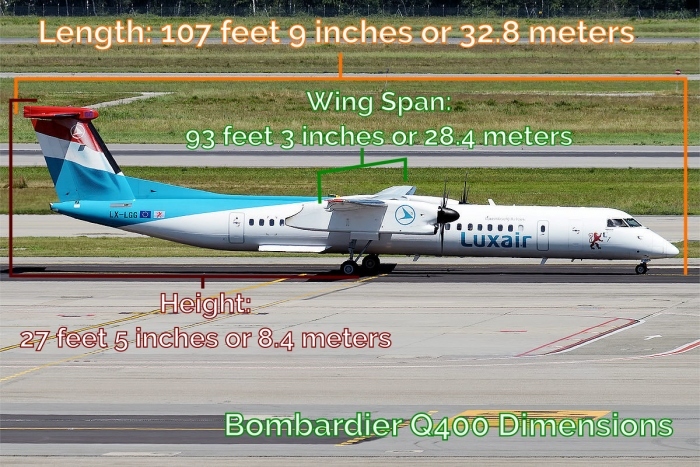 The dimensions of the aircraft are highlighted on the photo of a Luxair Bombardier Q400 turboprop (LX-LGG). The original photo was by Anna Zvereva on Flickr and Wikimedia Commons. FlyRadius has added the dimensions to the photo, while also also enhancing the quality of the photo. The above Q400 photo is released under a Creative Commons Attribution-Share Alike 2.0 Generic license. Above Bombardier Q400 Specifications and Dimensions Page Photo of a Porter Q400 by BriYYZ on Flickr. Photo (Only) released under a Creative Commons License. 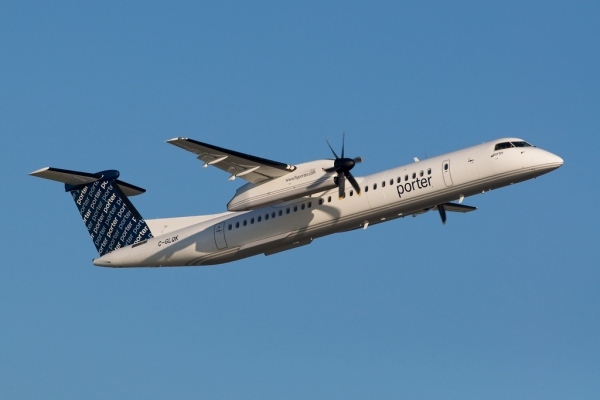 For more details on the Bombardier Q400 Specifications on Range visit our Bombardier Q400 Range page. Maximum Operating Altitude: 27,000 feet (In Flight). Originally was 25,000 Feet/Changed sometime in 2013 to 2015. Max 10,000 Feet for Landing and Takeoff. Fuel Capacity (Useable): 1,724 US Gallons or 11,724 Pounds. Specifications - Engines: 2 Pratt & Whitney Canada PW150A turboprop engines. Visit our PW150A - Bombardier Q400 Engine page for Q400 Engine specifications. Specifications - Propellers: Visit our Dowty R408 - Bombardier Q400 Propeller page for more details and Bombardier Q400 Propeller Specifications. More information on the turboprop can be found on the other articles that are listed in the Q400 menu. De Havilland Dash-8-400 Specifications - Dimensions: This is the original name for the regional turboprop aircraft. More on this name can be found on the Dash-8-400 page. Bombardier DH4 Specifications - Dimensions: DH4 is the IATA code for the aircraft. More info on the Q400 IATA code is found here. Bombardier DH8D Specifications - Dimensions: DH8D is the Q400's ICAO code that is used by companies and regulators to identify the aircraft. The learn more about the code visit the DH8D aircraft page. De Havilland Canada DHC-8-400 Specifications - Dimensions: DHC-8-400 is the official model name for the aircraft. More information is found on this page.